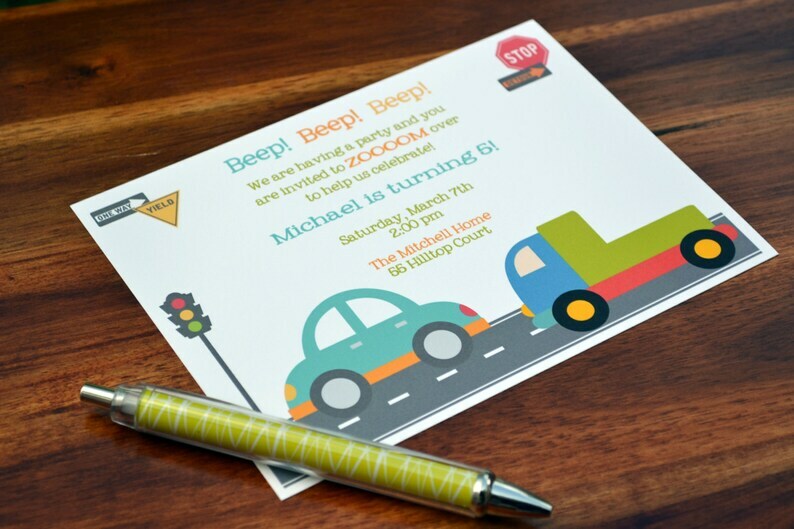 A great way to invite your guests to a transportation themed party for any age! The card is printed with a cute car and big truck and some fun road signs. Perfect for any truck or car lover! •This listing is for (20) 5x7 inch invitations and white envelopes. Valid only on items listed in the shop and not valid on any special requests. These were perfect for my daughter’s class for Valentines Day! Thanks again ; definitely will be back for more! I love these for so many reasons . It’s perfect for thank you cards and a just because card ! Great quality ! Love how they feel ! Payment must be made within 3 days of the transaction. If this can't work for you please convo me or send me an email at itsybitsypaper@yahoo.com and we can discuss it. I accept Paypal. Due to the fact that most items available are custom orders, refunds will not be accepted. If an item was never received, please contact me within 14 days of purchase. Once it has been proven that it never arrived, a refund will be issued at the discretion of itsy bitsy paper. If you are unhappy with your purchase or the service received please email me at itsybitsypaper@yahoo.com or convo me through Etsy and I will do my absolute best to resolve any issues you have. I strive to make each and every one of my customers happy and pleased with their purchase! I never want anyone feeling they had a bad experience. Orders are shipped as soon as they are printed. The order will ship via USPS Priority which typically takes 2 to 3 days. Orders will be sent to the shipping address provided by Etsy so if your address has changed please make note of that so it won't go to the wrong address. CONFIRMATION: I will email you when your items have shipped and I always request the Post Office sends you an email to confirm shipping with the confirmation number. International Shipping? Convo me and I will get your info and calculate the cost! I'd love to accomodate your order. BUYING A GIFT? : Convo me with the address you'd like the gift sent to along with a message to be included with the order and I'll ship at no extra charge. Proofs are emailed within 24 hours. PLEASE NOTE: If the proof is approved with an error the customer will be responsible for purchasing the Stock for a reprint. Please check each proof very well--address and phone numbers are the most overlooked items on a proof so make sure you look closely. Items typically ship in 3 to 4 Business Days after proof approval. Wording can always be changed on any style of invitation or stationery. Color too can be adjusted to match your needs. Please note that when you see a proof every computer is going to show color just a bit differently so when your item arrives it may not match exactly what you saw on the screen of your computer. I do my absolute best to make every color match your description but this is just one of those things that it's good to know in advance. Each card is printed with the company website on back.